When I bought my first car, I did very little research. Well, I looked up the type of models I was interested in, and I decided on a color, but I never once considered how financing a car would impact my budget. I ended up picking a budget based on what I deserved for a car as a newly working career woman. Not by how much the monthly payments would be. 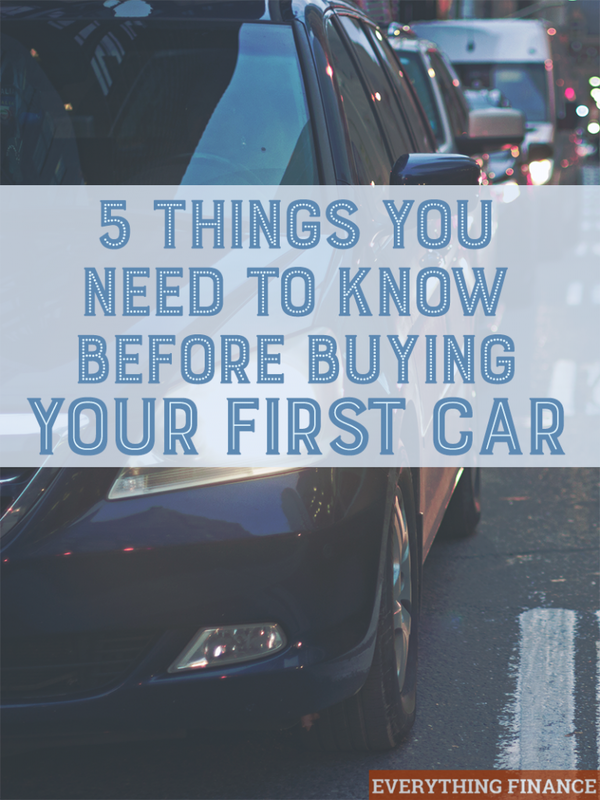 If I could do it all over again, these are the 5 things I wish I would have known before I bought my first car. And this is what I plan to do in the future when purchasing my next car. The first thing I would have done before buying my first car was to save for a much bigger down payment. Some financial experts advise paying for a car in cash. Unfortunately, that isn’t very realistic for most young professionals with thousands in student loans, who are working entry-level jobs and trying to make it on their own without financial help from their parents. However, that doesn’t mean you shouldn’t try and save as much as you possibly can before you plunk down cash for your car. Aim to save as much as you possibly can. I only put down $3,000 for a down payment on my car, and with taxes added in, it covered only slightly more than 10% of the purchase price. You should always aim for at least 20%, but that’s at a bare minimum. Always save as much as you possibly can, so that if you do have to finance, you can finance on a three-year term for minimum interest payments. Also, make sure your credit is in good shape, as that will also allow you to get the best interest rates offered. A lot of car salesmen will try and get you to buy more car than what your original budget was. This is because they want to get the biggest commission possible. Many times they will try and fool you on the cost of the car by talking about monthly payments, rather than the total sales price of the car. Don’t let them fool you! Never tell them what you would like the monthly payment to be. Always talk in terms of the total cost of the car. Car salesmen like to use this tactic because they can always lower the monthly payment to fit your budget by extending the length of the loan. I once knew a person who had a 7 year car loan simply because they signed the contract based on the monthly payments. When I bought my car, I thought I was signing a 5 year car loan, only to find out later, that it was actually a 6 year car loan! What a mess! Yes, these are shady tactics that car salesmen employ, but it’s up to you as the consumer to be vigilant and protect your wallet. By being vigilant, you’ll have less of a chance of falling for these tactics. If a car salesman tries to pull the wool over your eyes, keep them on point by reminding them you don’t want to hear about the monthly payments, only the total price of the car. With the advent of the internet, it has become easier than ever to be proactive in car buying. These days, you can actually email the online sales department of car dealerships in your area, and ask for their best price up front. By doing so, you save yourself a heck of a lot of time and a whole lot of hassle. Buying a car is notoriously known as a painful experience. Whenever you visit a car dealership just to “look around,” they will gladly show you several cars. Whenever you start asking about price, the car salesmen will step away as an excuse to make it look like they’re talking to their manager about price. Why do they employ these tactics? I have no idea. Perhaps it’s to build intimidation. They hope to wear you down with all the waiting so you’ll cave to a higher price, just to buy the car and get out of there. Most car buying experts agree: negotiate before you go to the dealership. By negotiating beforehand, you give yourself the upper hand. Car dealerships want to get you in their environment because it gives them more control. You can take control by making them give you a price before you go into the dealership. Email or call several dealerships and tell them the exact make and model you’re looking for. Ask them for their best deal, all fees included (such as any DMV fees). Then when you finally show up at the dealership, all you’ll have to do is test drive the car and fill out the paperwork. You can figure out what price to expect to pay for your car by looking at ads and sites like Edmunds. You can also request the car dealership invoice for what the dealership paid for the car. Despite all the homework and research you do, car salesmen will still try and pull some shady tricks to get you to pay more. It’s their job to try and make the most money possible, so can you fault them for trying? While I did my research online before buying a car, I did fall for shady sales tactics once I arrived at the dealership. My first mistake was emailing dealerships and not asking for the total cost out the door. This allowed dealerships to give me several different prices, but they weren’t all equal. One of them could have been for the full price out the door, whereas others could have been for just the car pre-tax, pre-fees. I ended up going to the dealership that emailed me the lowest offer, but once I got there, they added $1,000 to the price automatically for random things, like an extra coat of protective paint, some stickers to prevent scratching, etc. Now that I hear this, I think,“Man, what a fool I was!” But back when I was buying my first car, I was just a naïve 22-year-old with no car buying experience. Another thing to be careful for is the fine print. Read the contract in full. Car dealerships will try and slip several added costs into the contract. For example, one dealership told a friend of mine that they would get free lifetime car washes as part of an incentive to buy the car at that specific dealership. However, after reading through the contract in full, they found out that these “free car washes” actually amounted to an extra fee that would be rolled into the purchase price. Other sales tactics that are more easily noticeable are ones where the car salesmen is trying to rush you to make a purchase, often claiming that the price is only good for “that day.” When you hear this type of talk, go ahead and roll your eyes at the salesmen and tell him you will not be rushed and that you will go to another dealership where you will be valued. The threat of walking away will often make a salesman rethink their sales tactics and make them take you seriously. Once you purchase your car by being smart and vigilant, don’t let your car loan sit around by paying it monthly. Do everything in your power to get rid of it as quickly as you can. My car loan was $436 a month, which was outrageous considering I purchased a mid-size sedan. The car payment was such a heavy hit to my finances each month. When I finally got serious about paying off my debt, I knew that the car loan was the first thing that needed to go. Paying more than the minimum seemed impossible at first, until I started working freelance jobs on top of my day job. I also reduced my expenses to put every extra penny toward paying off my car loan. I paid it off more than a year early, and it felt so good to get rid of such a ginormous financial beast! Don’t get comfortable with your car payments. Do everything in your power to pay your car loan quickly. Think about the long-term use of your car. Buy a car that will last you years and will be reliable, not something that’s flashy just because you think you deserve it. Do everything in your power to avoid taking on debt. Is a car really necessary? Can you use public transportation to work? Carpool? Bike? Think about purchasing a used car. New cars depreciate in value as soon as you drive them off the lot. In our consumer-driven society, we’ve been trained to think that flashier is better. But I know that I feel much more comfortable when I have a solid bank account and don’t have debt eating up my income every month. Be smart with your car purchase.